You can find author of this guide here. Special thanks to Beast_Pete, Ironfisto and shinlogen for helping me with information to update. Had to remove Section 6 – Comparisons & Statistics due to space issues. Hopefully will be resolved soon. Warning: This guide is very image intensive. Please be patient and wait for them to load. Tip: Use CTRL+F and type in the index number to go straight to that section. Ever wondered what creeps would be useful to dominate? Which would benefit you the most? Where are they located? Hopefully this simple guide will give you a good idea of the neutral creeps that spawn and the best choices to use. Currently, there are only 3 methods of dominating creeps. Comments: Can be used by all heroes, which makes it a very versatile item. Lasts for 20 minutes (!) which is more or less a third of your normal one hour match. Only drawback is that it has an orb effect which might override other useful orbs and its 5 minute cooldown. Brings target unit under control of Aiushtha. If the unit cannot be converted, it will instead be slowed. Comments: Doesn’t work on Ancients or Golems. Now that it lasts 2 minutes (since 6.33), it looks like it’ll be a decent option now. However, the creep dies after its time period ends, causing you not to gain experience and gold. Takes control of a target enemy unit. Level 1 – 1 Unit Max. 75 HP Bonus. Level 2 – 1 Unit Max. 150 HP Bonus. Level 3 – 2 Unit Max. 225 HP Bonus. Level 4 – 3 Unit Max. 300 HP Bonus. Comments: The ham in Chen’s hamburger. The fact that it has a HP bonus and doesn’t have a time limit makes this the best choice if you’re going for a “creep dominating” built. Synergises very well with his other spells. Penitence to slow the enemy down while your creeps get into range, Test of Faith to instantly teleport your creep safety and Hand of God to fully heal your creeps. Even works with creeps dominated using the Helm of the Dominator. Only drawback is the unit cap. Controlled creeps can be easily killed with Devour (Lucifer – Doom Bringer) and Hand of Midas. Dominated creeps can’t be seen on the minimap, making them ideal for ganking. Only some are shown on the minimap as small dots (these are the high leveled creeps, meaning the Polar Furbolg Ursa Warrior, Satyr Hellcaller and Centaur Khan). Ancients and Golems can’t be dominated. Placing wards (observer or sentry) and any friendly unit on the neutral creep camp will prevent them from spawning. Roshan spawns immediately at the start of the game. The rest of the creeps spawn when allied creeps at both lanes at the sides of the map (left and right) start attacking opponent’s creeps. Spawns at minute 2:00. Being an Ancient doesn’t mean the creep is spell immune. Creeps that aren’t immune to all spells are the Black Drake, Dragonspawn Overseer and Sorcerer. Creeps will not spawn at their camp spots if there are remains of any corpse. The trigger that’s used to activate spawning is that the area is completely empty. Creeps spawn at the minute mark from minute 2:00 onwards. You can get vital and helpful tips for pulling and farming creeps by reading Creep Pulls and Jungling by Ironfisto (premium quality imo). Hand of Midas is a very useful farming tool that can reap great monetary benefits if used properly with the correct creeps. A detailed description of HoM as stated in the Item Ability Mana Costs, Cooldowns, Durations, etc. guide in the Mechanics section. Hand of Midas – Mana Cost: 25; Cooldown: 100; Duration: N/A; Range: 600; Max level on target: 5; Gold given: 2 bounties + 40% of unit gold cost. Though using it with normal creeps (Treant, Druid etc.) will still bring you in enough gold, what’s the harm in speeding the process up? The following table is a list of the average gold received from the highest to lowest. As you can clearly see, unless you see a Satyr Hellcaller, Enraged Wildkin, Centaur Khan, Dark Troll Warlord, Polar Furbolg Ursa Warrior, Polar Furbolg Champion, Mud Golem or Ogre Magi it’s best to just use HoM on the Druids/Necros. 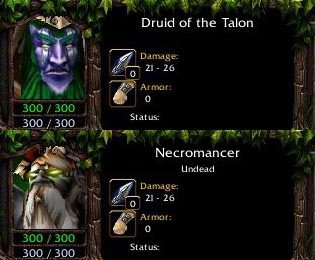 The recent update in 6.51 has meant that there are now more options that are of higher value Midased compared to the Druids/Necros. Purge is found on the Satyr Trickster. The recent removal of Abolish Magic in 6.42 has meant that there is now only one way to remove buffs and debuffs, which is through the Trickster. In-depth information on what can be and not purged can be found at sdfsdf’s Guide to Purge. The following are ultimates that can be removed by purge(worth remembering). Other useful abilties that can be purged. Ancient Tango of Essifation – Buff will remain, but healing will be stopped. Barathrum, Spiritbreaker – Charge of Darkness – Must purge charged unit. If vision of the unit remains, will charge as normal. If vision is lost, it is removed. Rooftrellan, Treant Protector – Eyes in the Forest – Tree can be purged. There is now no more debate as to which is better as Abolish Magic had been removed in 6.42. Thus, what’s left is only the use of the Satyr Trickster. As requested by ncpfen01, here’s a short discussion on Brilliance Auras. Ring of Basilius and Vladimir’s Offering will not stack with each other. However CM’s Brilliance Aura will (6.42). As of 6.42, Brilliance Auras are listed actual regen rates, no more percentages. A mini-guide to effective jungling. Thanks to Ironfisto for allowing me to use his pictures and info from his excellent Creep Pulls and Jungling Guide. Corpses takes approximately 15 secs to decay. 2 secs for the flesh to go to the ground, 12 secs for the bones to decay. If you have your finishing blow on the creep by the 45th sec, a new spawn will appear at the next full minute. Make sure you leave the area though. 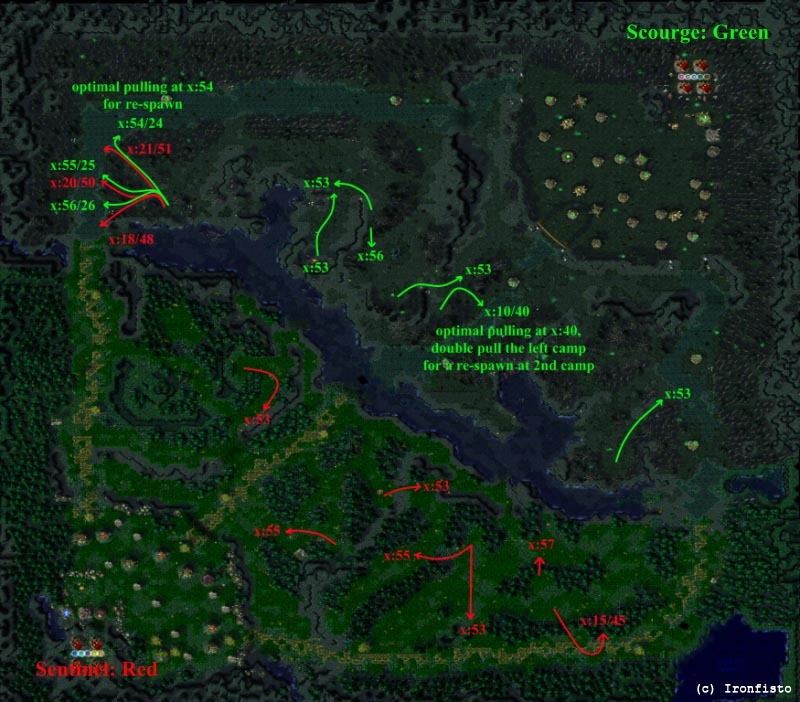 You have to be approximately 500-1000 (in most cases) range away from a creep camp for them to respawn. This includes your own/allied/enemy creeps controlled. If you have a hawk which has vision on the spawn point but is than the range, the creeps will still respawn. However, if you have no vision on the camp but you are less than the range, the creeps will not appear. 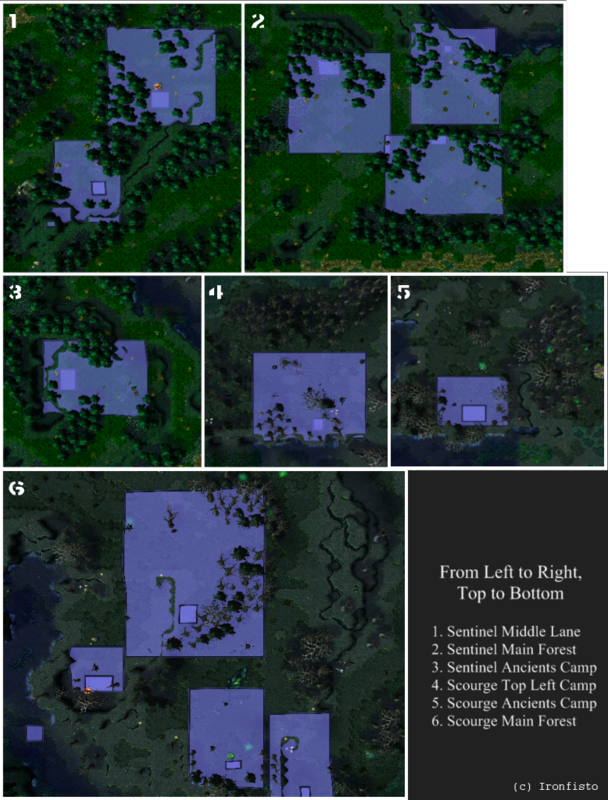 A more correct explanation to re-spawns condition is that each camp has an area bounded by a rectangle. If there exist a unit within the area, it will thus not respawn. The fact that it is not a circular area means that the range required to pull it is not always 1000 but varies since the width/length of the rectangle varies. All neutral creeps are set to “Guard mode” and have an Aggro of 300 (a more specific term is Acquisition Range). If you fall within that range, they will chase to hit you. Their “Guard” range is 600, ie to mean if they will continue hitting you till they die. If you go beyond 600 range, they will still continue to chase/hit you for 3 secs before they make a 180 turn and head back to their original spot to “Guard”. Given the 3 sec buffer time to lure the creeps out of the camp, it is possible to lure them out within a 500-1000 range and if done right, a new fresh creep spawn will appear in the abandoned camp. Once the original creeps return, you will have 2 sets of neutral spawns at the same spot. You can have 3 sets or more at the same spot too (but just for laughs only). Your lane creeps (Ghoul/Necro or Treant/Talons) have an Aggro of 500 for melee and 800 for ranged. Therefore if there is any neutral creeps hitting/chasing you within that distance, your creeps will ignore their original pathing and help you out. The following image should help you understand what is meant by the rectangular zones Ironfisto talks about. So all you have to do basically is to lure the creeps out of those zones by the minute mark for a new batch to respawn at the camp. Sounds easy right? The following picture will give you the timings to make it even easier to pull off. So that’s basically it. Read Ironfisto’s guide for more indepth explanation with videos. Thus, after 15 minutes, the number will be 2 to indicate to levels of upgrades that have occurred. 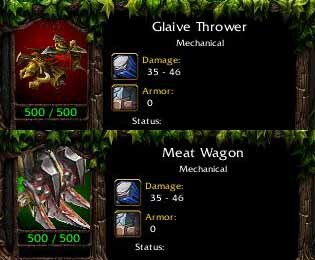 Note that this upgrade only happens to Treants/Ghouls and Druids/Necros, not Glaives/Meat. Here’s an illustration to help you better understand. If you’ve been playing for a while, you might have noticed that the number of creeps increase as the game goes on. Treants/Ghouls increase by one at minute 17:00 and increases every 16:30 minutes to a cap of 6 creeps. Druids/Necros & Glaives/Meats increase by one at minute 45:00 to a cap of 2 creeps. 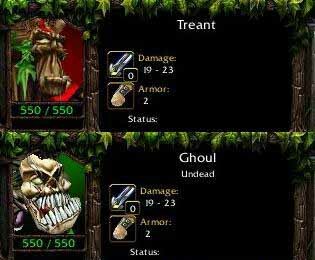 What it means is that throughout the whole game you can only have a maximum of 6 Treants/Ghouls, 2 Druids/Necros and 2 Glaives/Meats. Thus, creep increments for Treants/Ghouls will only occur at minute 17:00, 33:30, 50:00. Mega creeps happen when all the barracks in the opponent’s base are destroyed. All your creeps will gain a level 30 upgrade. Note that if middle lane has the last barracks that is destroyed, top and bottom lanes’ creeps would instantly upgrade to Mega level while the middle lane’s would only have upgraded creeps when they next spawn. Hope that helps you understand in more detail the process of creep upgrades. If you need clarification, I’d be happy to help explain it. The following image is the spawning locations of all the neutral creeps that you can find. There are 5 tiers of creeps that can be found throughout the map. Tier 1 units are the easiest and represented by the WHITE dots. Tier 2 units are mid level and represented by the BROWN dots. Tier 3 units are the hardest non-ancient creeps and are represented by the BLUE dots. Ancients are represented by the PINK dots. Roshan is represented by the YELLOW dot. Basically, certain groups of creeps spawn at certain locations. Each type of creep will spawn with another type of creep. The following images should illustrate what I’m trying to explain. Here’s the list of all the neutral creeps that spawn in alphabetical order. Upgrades: Increases health and damage every 7:30 minutes. Additional creep added initially at minute 17:00 and every 16:30 minutes to a max of 6 Treants/Ghouls. Upgrades: Increases health and damage every 7:30 minutes. Additional creep added at minute 45:00. Upgrades: Additional creep added at minute 45:00. Comments: Non-organic unit, only physical spells affect it. Has priority to attack towers first. Always ignored by creeps and towers till it is the last unit. Initially spawns at minute 4:30 and at intervals of 3:30 minutes. Abilities: Command Aura that gives 30% extra damage to the attack of nearby friendly units. Critical Strike that has a 20% chance to do 2 times normal damage. Abilities: Attacks deal 50%(?) Splash Attack. Comments: Unconvertable, it being an Ancient. Tough to kill at early levels. Gives the most gold for a single creep other than Roshan. Comments: Unconvertable, it being an Ancient. Slightly difficult to kill. Presence of the Black Dragon and another Black Drake makes it only more difficult to kill. Comments: Unconvertable, it being an Ancient. Difficult to kill at early levels. Comments: Uncontrollable, it being an Ancient. Difficult to kill at early levels, especially with two other Overseer’s in the group. Comments: One of the most sought after creeps to convert. Spawns fairly often and is easy to find. Can be found in both Tier 2 and 3 camps (though does not spawn as often in Tier 2 camps apparently). Has an aoe stun and a decent aura to boot. Highly recommended. Seeing as the Furbolg now has War Stomp removed, this would definitely be one of the most used creeps now. It’s easier to find and has an extra ability, though less mana than the Furbolg now (as of 6.40). Comments: Not worth your time. You would dominate the Centaur Khan that comes with him anyway. Abilities: Ensnare (150 mana) that causes a target unit to be bound to the ground for 1.5 secs. Raise Dead (50 mana) that raises 2 skeletons from a corpse. Abilities: Tornado (200 mana) is summoned that is controllable and slows enemy units’ movement and attack speed while damaging them. Lasts for 30 seconds. Comments: Not worth your time. Heal (5 mana, no CD) that heals 15 hp. Comments: Have never seen him being used before, though he has some decent abilities. However, he is too easy to kill and you would rather convert more tougher and useful creeps. The recent removal of Abolish Magic has more or less rendered this creep useless apart from its pitiful heal. Abilities: Frost Attack (12 mana, 0 sec CD) that slows the enemy’s movement and attack speed by 20%. Comments: Not worth it, even though the critical strike may look slightly appealing. 2 times normal damage would only give you around 42-48 damage which is really low. The very low hp also makes this creep a liability rather than an asset. Envenomed Weapons that does 2 damage per second for 20 seconds. Comments: Weak ability, low damage and very low hp make this creep simply useless. Comments: Unconvertable due to its immunity to magic. Really difficult to kill. Speed Aura that increases the movement speed of nearby friendly units by 12%. Comments: The nerf has weakened this creep and weakened what used ot be ‘t3h-l33t-ms-stacking combo’ completely. Its worth is now greatly diminished. It can be slightly useful now if you still want to increase the movement speed of the team. Comments: With Bash removed, this is really not worth it. Frost Armor (40 mana, 5 sec CD) that adds 8 armor and slows melee units attacking it for 5 seconds. Lasts 45 seconds. Comments: After a buff to Lich’s Frost Armor in 6.45, the Ogre’s spell isn’t really any better compared to the Lich’s which adds 12 amor, lasts for 40 seconds, slows melee units attacking for 2 seconds and has a cooldown of 5 seconds at Level 4. Reduction in armor means it is now slightly easier to kill. Note that Frost Armor is no more autocasted since the Magi starts with zero mana. Comments: Not worth it, though its chaos damage is good. Save it for its partner, the Polar Furbolg Ursa Warrior which has an aoe stun. Thunder Clap (100 mana, 12 sec CD) that deals 150 damange to nearby units and slowing their movement and attack speeds by 25% for 3 seconds. Comments: Unconvertable due to its immunity to magic. Slightly difficult to kill. Hurl Boulder that deals 100 damage and stuns for 2 seconds. Has a 10 second cooldown, costs 100 mana and has a range of 800. Slam that deals 70 damage and slows movement and attack speeds of units by 50% for 4(2) seconds. Has a 6 second cooldown, costs 90 mana and has an AoE of 250. “Reflect Damage” that reflects 20% damage back to melee units attacking it. Only available at 4th respawn onwards. “Destroys Illusions” that attack it instantly. Spell Block that dispels some targeted spells once every 15 seconds. Hardened Skin which makes him affected like heroes are. For example, he’s only stunned for 1 second by Paralyzing Cask. Drops one charge of Aegis (stackable). It no longer gives any stat bonuses, armor or magic resistance bonuses. It is basically an ankh of reincarnation that is droppable and vanishes after use. Reincarnation means that you revive instantly after being killed without giving gold and exp to the other team, and without losing any gold as well. Drops Cheese. Heals, for 5 mana, 2500 hp and 1000 mana. Only available at 3rd respawn onwards. Comments: The huge change in Roshan recently has meant that he is now killable over and over again. Though he respawns every 10 mins, which means you’ll normally be able to kill him probably 4 or 5 times at the most in a game. He becomes bigger and stronger everytime you kill him, so it gets more difficult after a while. Shockwave (100 mana, 8 sec CD) that deals 100 damage to land units in a line (no damage to buildings as of 6.40). Unholy Aura that increases hp regeneration by 3 hp/sec of nearby friendly units. Comments: A good unit to have early. 3hp/sec regen aura is very useful early on. Now that it can’t use Shockwave to damage buildings, it’s not really useful for pushes anymore. But its still a worthy addon as it has more mana for an additional Shockwave which will help weaken creeps for a push. It is now Midas-able as well (6.50). Mana Burns (50 mana, 18 sec CD) 100 mana of an enemy unit. Comments: Mana Burn is good but still doesn’t encourage the use of this unit. Not recommended. Now that its initial mana has been reduced to 0, it isn’t as much as a pain to farm it anymore. Purge (75 mana, 5 sec CD) that slows the movement speed of its target by a factor of 5 for 5 seconds. Also deals 400 damage to summoned units. Comments: Too weak and easy to kill. Not recommended. Supercreeps spawn when the -sc game mode is activated. They spawn at the same time for both sides, at random intervals and at random lanes. Comments: Ancient creep, therefore most spells do not work against it. Hopefully this guide has been useful to you as it was for me as I was compiling this. Please comment on how it can be improved, any errors, suggestions and the like. I would really appreciate it. I now realise how difficult and time consuming it is to put together a guide. Kudos to all other guide posters in the forum who have spent considerable amounts of time putting together their guides. Your work is not forgotten. Note: Only the logs of the last few versions will be posted as I seemed to have run out of text space. v3.5 – Posted on 8 July 2007. Update on Rock Golem’s change to non-ancient type for the pair group. Added Midas values for it. Added Warstomp aoe (rough value) and Ogre Magi notes due to Frost Armor buff on Lich. v3.6 – Posted on 7 September 2007. Minor update. Added change for Druid and Necro mana. v3.61 – Posted on 15 October 2007. Added new section, 3.05 Creep Pulling. v3.7 – Posted on 16 November 2007. Added new section, 3.06 Creep Upgrades. v3.71 – Posted on 29 January 2008. Added supercreeps info in Beastiary Section and changed the rectangular boxes map to corrected version. Refined Roshan info. v3.8 – Posted on 14 March 2008. Minor minor update to creep locations and HoM values. v3.81 – Posted on 22 March 2008. Bestiary updated. Temporarily removed section 6 due to character space issues.